The stylish accommodation provided by the Point Brisbane is central to everything that Brisbane has to offer, making it ideal for all different types of travellers to Brisbane. The Point Brisbane is one of the city's newest and most contemporary apartment hotels. It is conveniently situated in the picturesque city fringe suburb of Kangaroo Point, on the south bank of the Brisbane River and between the CBD and the GABBA cricket ground. 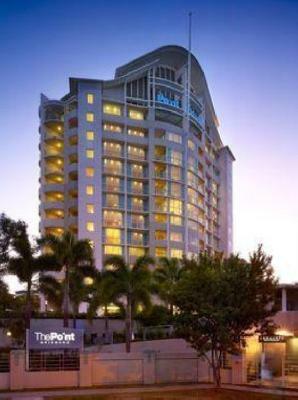 Combining a wide range of hotel accommodation, welcoming service and a central location The Point Brisbane is the perfect place to stay for both business and holiday travellers. This affordable property also has lots of great facilities including lounge bar, currency exchange services, direct internet access, disabled facilities, faxing facilities, free car parking, gymnasium, lift, restaurant, room service, tour desk, 24 hour reception, baby cots available for families and daily housekeeping. This quality hotel provides two new styles of accommodation in its new tower and has sweeping city skyline and river views. 1 Bedrm Exec Suite : Sleeps up to 3 guests on 1 King Bed & Rollaway Bed. Deluxe Studio Room : Sleeps up to 2 guests on 1 King Bed or 2 Single Beds. King Hotel Suite : Sleeps up to 2 guests on 1 King Bed. Studio Room : Sleeps up to 2 guests on 1 Queen Bed or 2 Single Beds.